It's 23rd July, that means that Daniel turned 29 today. And up to 30 next year... time flies. Even though we know he doesn't "Google his name", feel free to wish him a Happy Birthday via danieljradcliffe.tk's Twitter, Facebook (I prefer below this post, and don't forget to 'like' the page) or simply by adding a comment below. Sadly it's not possible to leave comment on his official Google+ page. I think I'll be mainly busy with keeping track of Twitter mentions through the day. Update: 24th July 2018. New Google+ post. 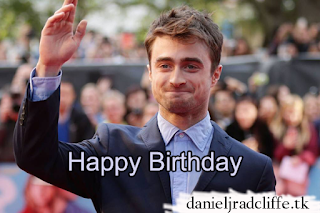 "Happy Birthday to the one and only Daniel Radcliffe!"